I love biscuits. Since they don't need to rise, you can have them mixed and in the oven before your coffee is done brewing, which makes them perfect for breakfast or brunch. Dinner, too. If you keep self-rising flour on-hand, they're even easier. You can buy it or make your own mix to have when you need it. 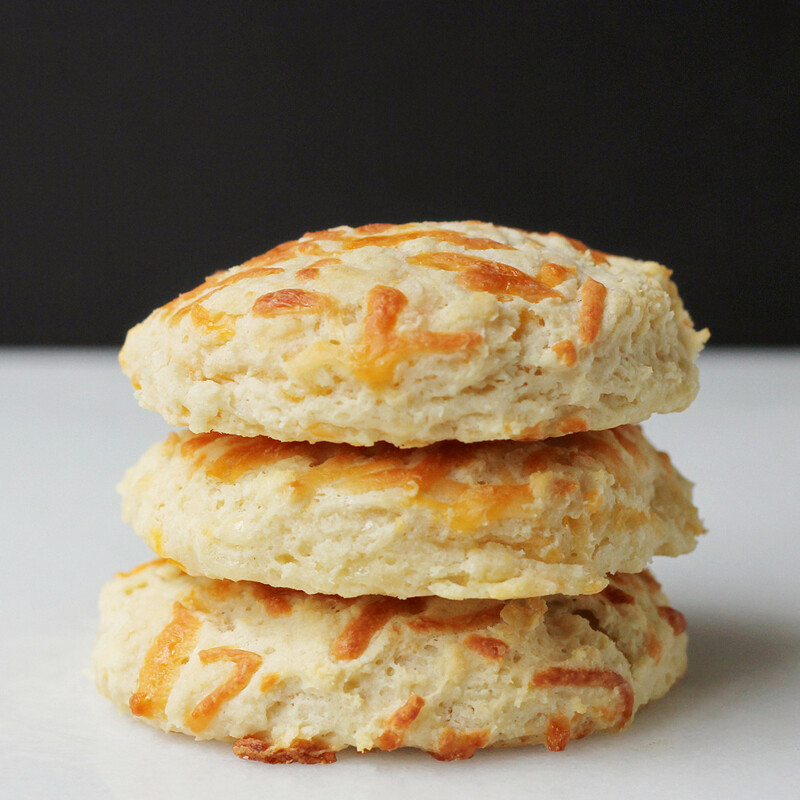 These biscuits are flavored with shredded cheese. I used a store-bought Mexican mix with both yellow and white cheese, but use what you like. Yellow cheese will show up a little better, but even a white cheese will show on top as it browns in the oven. I've tried a few recipes using Country Crock Spread lately, but this time I used the sticks. I think I like them better for baking, but I'm still in the experimental stages. Heat the oven to 400 degrees and line a baking sheet with parchment paper. Put the flour and sugar in a medium bowl. 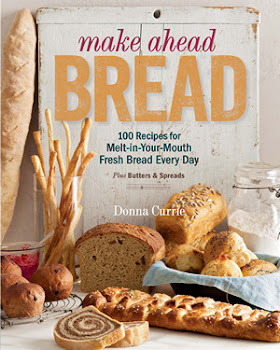 Add the Country Crock and cut with a pastry cutter or two knives until you have bits as small as cornmeal and no larger than lentils. Add 1/2 cup of the cheese and stir to distribute it. Add the buttermilk and fold it in until there are few dry spots left. It's perfectly fine if there are some powdery places, as long as there aren't giant desserts of dry flour. Turn the mixture out onto your work surface, and, using a bench scraper and your hands, first pat it down, then fold it over itself. Pat down and fold. After the third or fourth pat-and-fold, you should have a dough that's holding together. Portion the dough into 8 pieces - you can use a disher to make a more round blob - and place them onto your baking sheet leaving space between them - they will spread a bit. Use your palm to flatten them a bit. 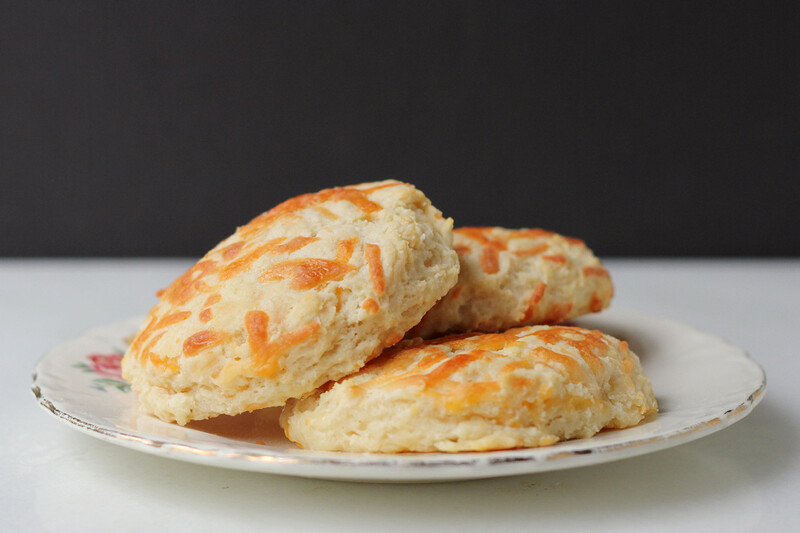 Sprinkle the tops of the biscuits with the remaining cheese. Place the pan in the oven and bake until the cheese is melted on top and beginning to brown and the biscuits are just starting to brown, about 20 minutes. Remove the biscuits from the pan and place on a rack. Serve warm.